Flash Furniture YT-WTFT18X72-TBL-GG Rectangular Wood Folding Training / Seminar Table with Smooth Clear Coated Finished Top 18" x 72"
TigerChef > Furniture > Flash Furniture > Flash Furniture Restaurant Tables >< Flash Furniture Folding Tables > Flash Furniture YT-WTFT18X72-TBL-GG Rectangular Wood Folding Training / Seminar Table with Smooth Clear Coated Finished Top 18" x 72"
$72.99 Flash Furniture RB-1860-1-GG Plastic Folding Training Table with 2 Gray Metal Folding Chairs 18" x 60"
$85.99 Flash Furniture RB-1860-2-GG Plastic Folding Training Table with 2 Black Plastic Stack Chairs 18" x 60"
$98.99 Flash Furniture RB-1872-1-GG Plastic Folding Training Table with 2 Crown Back Stack Chairs 18" x 72"
$90.99 Flash Furniture RB-1872-2-GG Plastic Folding Training Table with 2 Trapezoidal Back Stack Chairs 18" x 72"
$121.99 Flash Furniture RB-1896-1-GG Plastic Folding Training Table with 3 Black Plastic Stack Chairs 18" x 96"
$108.99 Flash Furniture RB-1896-2-GG Plastic Folding Training Table with 3 White Plastic Folding Chairs 18" x 96"
$67.99 Flash Furniture YT-1860-HIGH-WAL-GG Rectangular High Pressure Laminate Folding Training Table 18" x 60"
$73.99 Flash Furniture YT-1872-HIGH-WAL-GG Rectangular High Pressure Laminate Folding Training Table 18" x 72"
A great addition to hotels, restaurants and other event management businesses, the Flash Furniture Rectangular Wood Folding Training / Seminar Table with Smooth Clear Coated Finished Top 18" x 72" features exceptional durability that will withstand years of use. 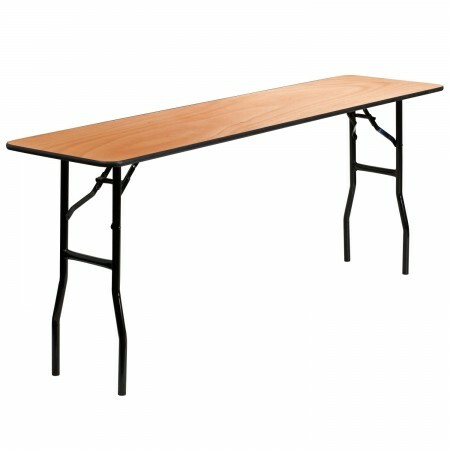 This table is designed with convenience in mind and allows for hassle free storage and easy setup so your staff can quickly arrange function rooms for guests. Built with non-marring foot caps, this commercial grade rectangular folding table will not scratch your floor surfaces when dragged. Dimensions: 18" x 30-1/4" x 72"
How many chairs/people can sit comfortably at one table? This table seats 3 adults. how tall is this off the floor? Will this table warp if used in a covered outdoor space,? This is for indoor use and would possibly warp if kept outdoors.